I usually wake up early around 6 in the morning. I exercises for about an hour. After that, I go to the university. Down to earth, with a good sense of humor, treats people around in really good way, intelligent, sounds very polite, well-mannered. I think it's for the better))). As for me, my ideal man, I am looking for, will be able to fulfil my soul, to share his feelings, warmness, love and kindness. I have a really bright example of my parents how to manage a magnificent relations saving the pure feeling during the long time. There is a hard mutual work of both partners but these efforts make people incredibly happy. I am here to find my decent partner who is not afraid of any obstacles on the way of our common happiness. Is this type of a family you are looking for? What can I really consider myself for now, it's a good guitarist)) Would you like to listen)? I have a lot of pics and videos from my concert. Or should I invite you for the one for real)? 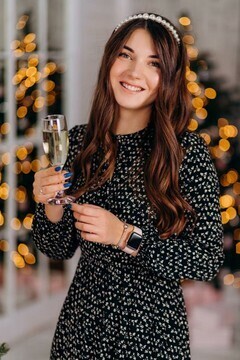 If you are interested who I am I will tell you with a big pleasure, just ask, I will tell you all the truth) and please, be honest from the beginning as well. I am here only for the serious relationship based on trust, honesty. I need my second half with whom I could be totally happy. First of all I want to become a good specialist in physiotherapy, as I really like to help people. And I adore this profession from my early years. When I was small my dad used to have a big problem with his back, and he often was in the hospital, we visited him with mom a lot. At that time I was got in "love" if I can say so, hehe, with an awesome doctor who treated him, when others said it was impossible to help. I knew nothing about adult love in that time of course and I don't know what happened to that doctor after years, but I remember how I brought him a flowers from our garden, and drew different ugly pics, as I just started doing it, he smiled every time and it was a sign for me that was mutual, hehe. I don't like mess, i like when everything on right places. I like to cook most of all with my mom. As for me, my ideal man, I am looking for, will be able to fulfil my soul, to share his feelings, warmness, love and kindness. A man, who is not afraid of being honest creating strong relationship. I need my second half with whom I could be totally happy. I am here to meet a man with whom I can build a strong family, full of love, respect, understanding and bright moments. Is this type of a family you are looking for? As for me, my ideal man, I am looking for, will be able to fulfil my soul, to share his feelings, warmness, love and kindness. My biggest passion which I can't call only hobby, is singing and playing the guitar, I wish my future husband support me in it) Can you play any instrument? Would you like me to teach you)? I love fishing, as my dad taught me it from childhood, he is a very good fisherman) Also reading and drawing. A few years ago, I was fascinated by the different conspiracy theories about the mysteries of the Bermuda triangle, killing of John Kennedy etc, but interest has become less with time. I think it's for the better))). When I was small my dad used to have a big problem with his back, and he often was in the hospital, we visited him with mom a lot. I usually wake up early around 6 in the morning. I exercises for about an hour. After that, I go to the university. My day at the uni starts usually at 8:30 in the morning, when I arrived safely there, showing the student card to security guard, so that he let me in and He let me did it)) even i'm late sometime like girls should hehe And after classes, I meet with friends and we often think up something fun and different to do. Also i attend my guitar and singinf lessons few times a week after university. 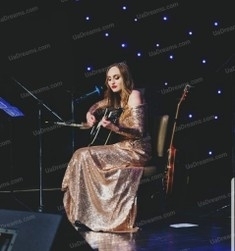 My biggest passion which I can't call only hobby, is singing and playing the guitar, I wish my future husband support me in it) Can you play any instrument? I like house work as it's makes me relaxed, i like how everything became clean and nice with help of my hands. It's even helps to calm me down sometimes. I don't like mess, i like when everything on right places. I like to cook most of all with my mom. My lasagna is the best in the world everyone tell me it, would you like to check))?